What consitutes the Eurozone? - Where is the Euro the official currency? In the countries issuing Euro coins you say - well yes obviously but something many people don't know is that in many other countries in Europe, Africa and South America as well several islands, the Euro is also the official currency. Before looking at the list of countries below, give your imagination free reign and see how many you guess. Four of these countries Andorra, Monaco, San Marino and the Vatican, although issuing their own Euro coins are not members of the European Union. These belong to a group known as the European microstates - the other member is Lichtenstein. They can issue their own coins with their own designs on the "national side". Eurozone Countries not issuing Euros. 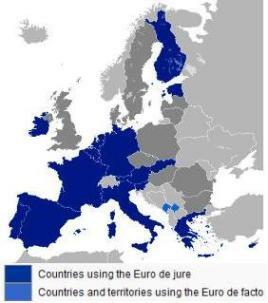 Although the following countries do not issue Euro Coins, they use the Euro as their official currency and are therefore in the Eurozone. Several countries, while retaining their own currencies are now bound to the Euro in the sense that there is a fixed conversion rate between their currencies and the Euro. Whether the Eurozone will expand or contract in the future is, at the moment, debatable. Several EU members which are not yet in the Eurozone -e.g. Hungary, Bulgaria, Poland may well join although due to the Euro crisis some of these, for example Poland,are now noticeably less enthusiastic than previously. It is also conceivable that some of the current "problem countries" - notably Greece but also Ireland, Portugal and Spain may leave - we shall see! Return from Eurozone to euro-coin-collector.